"This classic Italian-American comfort food works with any kind of sausage, but I like the fennel and anise flavors of sweet Italian sausage with the beans--it's a hearty soup that's fast and easy to put together." Heat oil in a skillet over medium-high heat. Brown sausage while breaking it into small pieces, about 5 minutes. Reduce heat to medium. Add diced celery and chopped onion. Cook until onions are translucent, 4 to 5 minutes. Add dry pasta. Cook and stir 2 minutes. Stir in tomato paste until evenly distributed, 2 to 3 minutes. Add 3 cups broth. Raise heat to high and bring to a simmer. Add salt, black pepper, pepper flakes, and oregano. When soup comes to a boil, reduce heat to medium and let it simmer about 5 minutes, stirring often. Check soup consistency and add more broth, if needed. Place chopped chard in a bowl. Cover with cold water and rinse the leaves; any grit will fall to the bottom of the bowl. Transfer chard to colander to drain briefly; add to soup. Cook and stir until leaves wilt, 2 to 3 minutes. Stir in white beans; continue cooking and stirring until pasta is perfectly cooked, another 4 or 5 minutes. Remove from heat and stir in grated cheese. Serve topped with grated cheese, if desired. 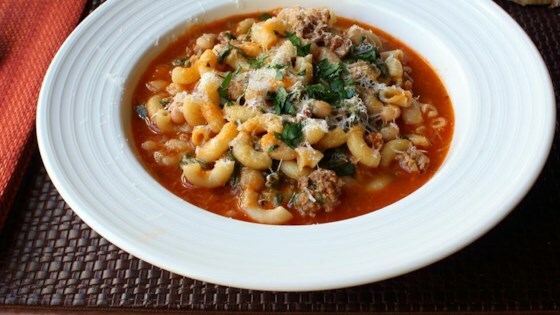 Watch how to make this savory Italian soup. This recipe makes enough for 2 large portions or 4 smaller ones. I made it straight the first time, and the second time substituted kale for chard and leeks for the onion. Even better! This is a super yummy soup I fantasize ahead about eating! I wish I could give this 10 stars! Absolutely LOVE it! My changes were spinach in lieu of swiss chard, ditalini in lieu of elbow and added more broth (used 32 oz. ).